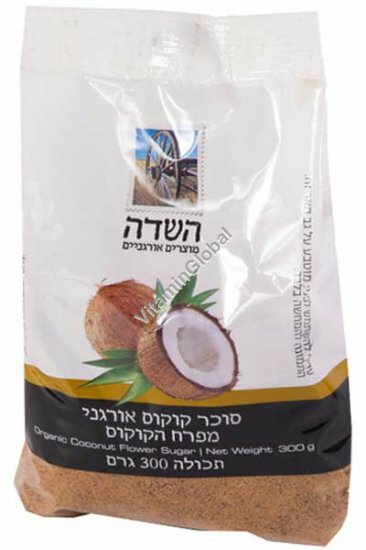 Coconut sugar has been used as a traditional sweetener for centuries throughout South East Asia. Coconut sugar is produced by cutting open a spadix, which is the tubular flower core that becomes a coconut. A coconut spadix is rich with sap. The sap is collected and then dried, becoming the granular coconut sugar that is so popular today with health-conscious consumers around the world. Coconut sugar, with its delicate sweetness, is quite similar to brown sugar, but with a hint of caramel. Since coconut sugar is unprocessed, its color, sweetness, and flavor, can vary depending on the species and harvesting season. Kosher Parve under the supervision of the Migdal Haemek Rabbinate.